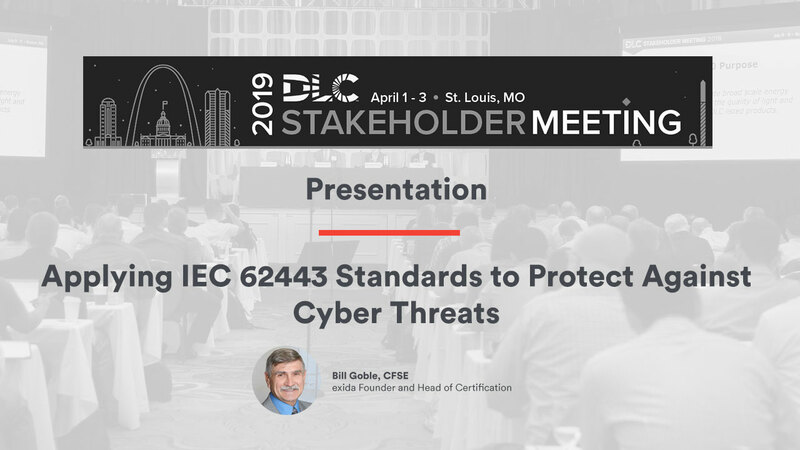 exida founder and Head of Certification William Goble will give a presentation at the 2019 DLC Stakeholder Meeting on how to apply IEC 62443 to protect against cyber threats. It is appropriate that Automation OEMs in many different industries are successfully getting their products and systems certified to IEC 62443 standards. The IEC 62443 automation cybersecurity standards provide a solid framework to improve cybersecurity strength of any automation product or system. Different parts of the standard cover OEM products and systems, integrator engineering processes and systems, and system operation. This workshop will introduce the various parts of IEC 62443, how each part can be applied by manufacturers of networked lighting control systems, and the IEC 62443 certification infrastructure. Participants will be able to identify the sections of the global automation cybersecurity standard IEC 62443 that apply to embedded systems, integrated systems, and site operations. Participants will be able to plan IEC 62443 certification projects. Participants will be able to choose target security levels for their products and systems.